I remember getting the phone call ten years ago that would burn a big ol’ hole through my summer plans. I had been promised a summer job at the Chester County Migrant Ministry, but when I called to confirm just weeks before my starting date, my old boss said she no longer needed me. Here I had been sitting pretty in my college classes watching others hustle last minute for that lucrative summer job, and now my boss leaves me to scramble just like that. I knew what I had to do. But I didn’t want to do it. It wasn’t glamorous like translation work with Mexican immigrants would’ve been; even worse, it was sort of the family business. And what recent teen wants to work with their family? But I needed the money. Even more so than that, I wanted the money. It was inevitable: I would drive the Amish around for the summer. The job is simple: an Amish person, who cannot own a vehicle, calls an Amish Taxi Driver up and asks to be taken to XYZ on X date at X time. You pick them up, they usually have a bazillion little stops to make (you would too if you knew you didn’t have access to places further than a horse ride away for awhile), and then you take them home. They pay you by the mile, and then they pay you $10/hour waiting time while they shop, make a “visit” (this could mean anything from making house calls to making hospital calls on family, friends, and community members), or see a chiropractor, etc. That summer I made a sweeeeeet $3,000 which was made up of $0.60/mile + $10/hour of waiting time. I’d say my driving days were over after that, but to be honest the gig kind of grew on me. That next semester my dad scored a market run for me at $120/day. There was only one problem with it: I had to wake up every Saturday at 4:00 a.m. to make the pickups. The earnings, however, far outweighed the inconvenience of waking up before sunrise, and allowed me to earn what it would take 23.3 hours to earn at my work study job behind the desk. The best federal work study job you could get, btw – the college library at $5.15/hour. My dad has driven Amish full-time for 14 Years. When I call him, I don’t ask “how are you”? Instead, I greet him with, “where are you”? That’s because his job literally takes him all over PA, the United States, and even into Canada. One thing you have to be prepared for in a tight-knit community with no television is that gossip + details get around. Like, really fast. So if you’re good at what you do, you will get random phone calls asking for more! My father currently drives roughly 80,000 miles/year, and his taxable income last year was $33,000. His gross income per month runs around $5,000, or $70,000 a year. My father is a numbers man like I am, so I’ll let him tell you some more. “For the first few years, I was happy with $0.40/mile profit after paying gas and stuff. At the $1.00/mile I’m charging now, you’re roughly going to pay $0.15/mile for repairs/costs on insurance/purchasing vehicle over a 4-5 year period (payment period), and your gas cost is going to be about $0.20/mile right now. Other than that, the rest of it is pure profit. When you’re just starting out, this feels like the easiest money in the world. And it truly can be. But there are a few extra steps on that stairway to money-making heaven. Commercial Car Insurance: This varies, but my dad pays an estimated $1,500/year. Department of Transportation Registration: This costs $40. You also need to put a registration label on your vehicle, as well as keep a first aid kit and fire extinguisher in the vehicles at all time. Public Utility Commission Cut: You need to obtain a Certificate of Public Convenience from the PUC, which costs $350 (renewed annually). You then must report your gross intrastate revenues to the PUC. The PUC assesses a portion to collect and sends out your bill. Aside from the insurance and registrations, putting nearly 80,000 miles/year on a vehicle is also going to lead to consistent maintenance and repair costs. “I try to put 300,000 miles on my vehicles before I trade it in. I say I try. It has a lot to do with the respect you have for your vehicle. I’ve probably had, I’m guessing, about six vehicles in those 14 years. I buy them used with low mileage on them. I try not to buy a vehicle with more than 35,000 miles when I purchase it. I just don’t want to put that much money out for a vehicle. And then there’s the gas. In his 14 years, my father has seen gas prices from $1.50/gallon all the way up to $4.00/gallon. Getting to be a fly on the wall to an entirely different culture without having to leave the country is pretty amazing. It’s led to some really cool and sometimes just downright interesting opportunities. Like the time I took an Amish family to the beach (yes, I saw the Amish in their bathing suits). Or the time I got to take a family down to their Englishmen friends in Baltimore. This led to driving into D.C. the next day and taking the Amish on their very first metro trip (and from the looks of the passengers, their very first sight at the Amish!). Holy cow was that one interesting. And then there was the Amish version of a night out on the town in the cabin. You can bet it was hard to keep a straight face. Probably my favorite memory of all time though was getting invited during Christmastime to a dinner with my dad for employee appreciation by the man I drove to the market. We sat side by side on straw bales in a hay barn set up like a beautiful dining room and ate a fantastic meal together. When it comes down to it, this was one of the best side gigs I’ve ever had. Aside from it being very lucrative, I got to do things like learn the countryside while also getting in some good knitting and reading during wait times. But the experiences are what I’ll never forget, that’s for sure. Amanda is the creator and writer behind – a site where she shows cash-strapped Family CFOs how to live a VIP life on an average paycheck (sans ramen noodle dinners). Come hang out with her on Pinterest, where you can take part in her free ! Hi Amanda. That’s quite an experience and a well paying side hustle / summer gig. Your dad may be the only taxi driver not feeling threatened by Uber right now! I’m sure you are proud of him, very entrepreneurial and he definitely took the lemon and made lemonade with it. Thanks for sharing and I look forward to following your blog. Yes–we Grossmans are self-starters for sure:). Thanks so much for your interest! This is awesome! I love how your dad made a family business out of this. I didn’t appreciate it at the time (well, in the beginning) because it seemed like such an “uncool” thing to a barely 20-year old. But yes, very cool and something I really enjoyed doing! It’s nice when you can start making money from something your parents make money at as well. I was lucky to have that to fall back on when the other job fell through. Wow! What an amazing experience to see a different culture up-close like that. I’m so jealous! It is SO fun learning about the Amish, but yes, this kind of job really gives you insider knowledge. You should go visit Lancaster County, PA! I love the way you rephrased that. Yes, that one phone call was worth quite a lot:). 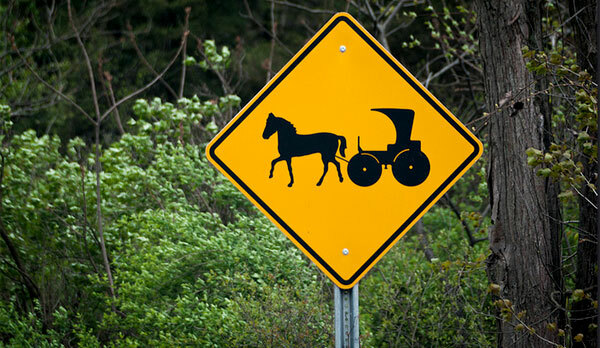 We live in an area that has a large Amish population (in western NY) and we share the roads with the horses and buggies. We often see the vans of Amish being driven places too. That is a great side gig and I’m sure the folks are wonderful clients! We also have a large Amish population where our vacation home is in Sarasota, FL. They even have an area to tie the horses up at all the “big box” stores too! Haha–there is definitely a horse shed at our local Walmart, and there’s always horse poop there:). I used to live in Florida and heard about the colony in Sarasota; unfortunately I never got to visit. My husband is from Schuylkill county so we always see the buggies around when we visit. Sometimes we even see a little boy on their “bicycle,” essentially a wooden scooter. The local Walmart even has wooden ties for the horses in the parking lot for their Amish customers. I’m curious, Amanda, do you I know if Amish are ever taxied to jobs a ways away? My husband’s parents had Amish in their area do their roof (an excellent job no less) for a great price and as Philly-area resident, I wondered if we could ever pay Amish from their area to come down and do our roof, as even with paying for transportation, it would be cheaper. Did your dad ever taxi folks for big one-two day jobs? I do believe so–he’s taken them as far as Montana for visiting, and Canada for business (specifically one Amish person had repeat business in Canada). If you can find a driver and pay their transportation (because in this case it would really add to their costs), then I’ll bet they would take you up on the offer. I’m glad you enjoyed! What do you mean by “there’s a parallel for FIRE…”? Talk about a niche business. Very cool. 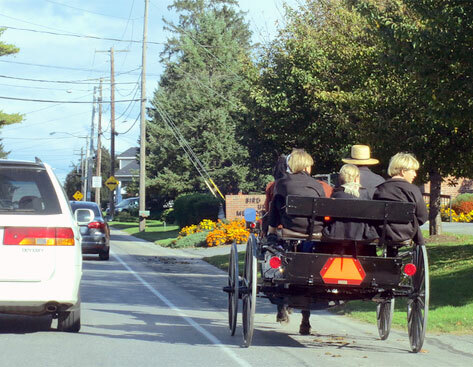 We have spent time in Pennsylvania, and camping in the Northeast and Amish is a common sight. I never thought about it that way, but yes, definitely niche! PA is lovely. Don’t forget to gorge on some whoopie pies the next time you’re there for me (the pumpkin ones are even better than the chocolate ones, I think). Wow, that’s an awesome summer job. Probably can’t do it as a part time job, though. I imagine demand will be too high. Maybe just for the weekend? Demand gets high if you’re consistent, and your car has A/C! Very interesting side hustle and something I never would have thought of in a million years. I think it would be fascinating to get an insider look at the Amish culture! Truly fascinating. Thanks for reading! Great Side Hustle! I bet you got to me some interesting characters! Learn something new every day. I went to Huntingdon,Pa to visit my grandparents and it is beautiful country. The plain people of Pennsylvania are wonderful. I was fortunate to live in PA growing up, and have family in Amish country, so I would visit Amish and Mennonite families several times a year through my family connections. Mock them for their “backward” and low tech ways, but the community and togetherness they foster is a source of strength inconceivable to 99% of modern Americans. There are definitely worse ways to live your life. DEFINITELY worse ways to live your life. It’s beautiful country, and the community is like something I’ve never experienced. That’s so incredible! I love that it’s the kind of side hustle where the experience itself is almost worth it – BUT you get to make money too! What a cool post! I love how you painted a very vivid picture of this side-gig, which could have ultimately become a mainstay career in your dad’s case. Nice job using out-of-the-box thinking to fill that cash void over the summer! It just goes to show how powerful creativity can be when harnessed properly. That sounds like a really nice job. We had our roof done by the Mennonites a few years ago and they also had a driver bring them into town. They lived about 45 minutes away from us. They were simple people but they worked hard every minute they were there. They were appreciative when I would set out ice tea, lemonade or ice water for them on those hot days. I joked when I made cookies for them on the last day that I was sure the wives were better but I wanted to show my appreciation for a job well done. Nice!! We’ve had several Amish do work on our properties over the years. Watching a barn raising is also really something. They don’t mess around! Thanks for sharing this great article J. Money. Like Amanda @centsiblyrich I would never have thought of this as a side hustle, or a business. I am going to share this article on my blog. P.S. I’m very glad you liked the article! Thanks for letting us know. Question for J. Money, or Amanda Grossman. I assume that it is okay to share this article. Am I correct in my assumption? Naturally I would give credit to where I got the article. If I need to get permission from either one of you please let me know if that is the case, and if it is okay to discuss the article, or share it on my blog. Thank you. It would probably help if I told you the name of my blog. :) It is . Generally speaking (and I can’t speak for J. Money here, but I’m a blogger myself), you wouldn’t share the entire article because doing so brings up issues with duplicate content with google, as well as with copyrights. However, you could share what you liked about the article and then link to it, or share other information with your readers, and then link to it. Yes, that makes much sense, and it is what I had in mind. I appreciate your prompt response. Have a great weekend. Thanks for sharing it, Karlene! Sorry I was MIA for a bit there – in process of moving and was beyond excited when Amanda shot me this to give me a day off :) But yup, my thoughts are aligned w/ Amanda’s there. Hope your audience enjoys it! That is a cool summer job. You earned a lot. It’s a good thing you experienced such job and it has taught you great lessons. That’s cool you know someone! Yes–you’re basically on call at any time and any hour (and they WILL call you at weird hours). However, you can always say “no”. Then again, the more you say “no”, the less you’ll get called. Hi im interested in driving for the Amish if possible. I have a minivan so it would be very convient.thanks. 610-875-0071. I feel like this story has the lesson that “There are opportunities all around you, you just need to open your eyes.” Your dad envisioned that opportunity and turned it into an awesome, extremely interesting business. I never knew something like this even existed! That’s awesome to finally hear life from the perspective of an Amish taxi driver. When we lived in Kentucky, we had the privilege of befriending an Amish family & they had a courier take them everywhere (even the beach for vacation!) when they couldn’t go to the store or down the road. So glad to have provided you with a look at the “inside”:). Sounds like an awesome side gig. And I’m sure there are additional benefits from dealing with the Amish. We love dealing with them but have to go out of our way pretty far to get to the Amish store that we buy our 50 lb. bags of oatmeal at. Ooooh I want to try out some of that!! I bet it tastes so fresh! Oooh yes–Amish bulk good stores rock. I really miss having access to those here in Houston. I’ll shamelessly admit I was laughing out loud at the part about the phone shed and the cassette tapes that were probably contraband. And if there’s any Amish people reading this comment, know I love you and am happy you contribute to the wonderful diversity of our country. Excellent write up Amanda. Looking forward to reading your blog. Cool! I had a relative who used to do this. She lives in Lancaster County. This sounds like such a cool side gig! I think your dad would pass out at the price of fuel over here! That must have been an interesting job, I love seeing how other people live their lives. Always had a bit of a fascination with the Amish. Are you considered self employed and receive a 1099 and end up paying tax on these wages? Which permit did you have? Taxi or Paratransit? Previous post: 10 Months Without Cable! Still Alive!